Imagine a young girl enchanted with the world around her, spending her time outside. She nurtures and releases wounded animals, digs in the dirt searching for fossils and dinosaur bones, collects rocks, presses interesting leaves and flowers, watches the sky at night, and spends every spring at the farm down the road hoping to see a new calf or lamb make its way into the world. She has a family that encourages her pursuits. What she lacks are female role models. In the male-dominated world of science, her role models are Cousteau, Darwin, Mendel, Galileo, Einstein, Edison, and others. That girl grew up to love and teach science, despite finding no one beyond Marie Curie to ignite her imagination. Today you can inspire young people with stories of women whose contributions in science span centuries and disciplines. The daughter of Theon, a mathematician, philosopher, and the last director of the Library at Alexandria, Hypatia was educated in the ways of many young men of her time and was one of the first women to study math, science, and philosophy. She is considered the first woman to make a substantial contribution to the development of mathematics, having written a treatise on conic sections. She is credited with the charting of celestial bodies and the invention of the hydrometer, though there is some disagreement about whether or not she was the first inventor of the astrolabe. 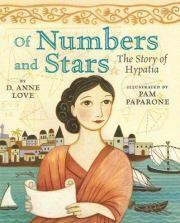 OF NUMBERS AND STARS: THE STORY OF HYPATIA, written by D. Anne Love and illustrated by Pamela Paparone, provides a nice overview of the time and place in which Hypatia lived. The artwork evokes both Egyptian and Greek styles and nicely incorporates images that reflect the subjects Hypatia studied. This is a carefully crafted picture book biography on a woman that little is known of. Despite this, her story is one that will inspire. Included are an author's note and bibliography, as well as some additional notes about mathematics. Poets and artists must have a bit of scientist in them, as they must closely observe the world around them in order to share it from their unique perspective. Maria Merian was an artist and scientist who studied plants and animals in their natural habitat and then captured them in her art. Not only did she document the flora and fauna in her native Germany, but in 1699 she also traveled to South America where she studied and sketched plants and animals unlike any others she had seen. 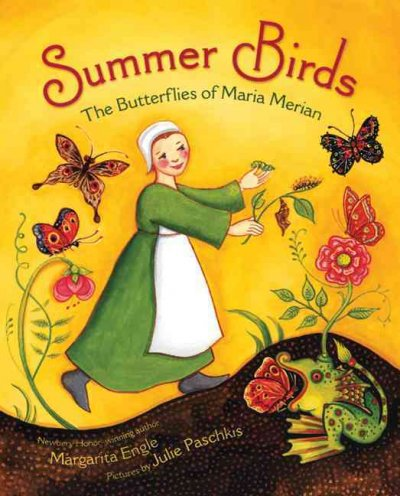 SUMMER BIRDS: THE BUTTERFLIES OF MARIA MERIAN , written by Margarita Engle and illustrated by Julie Paschkis, is based on the true story of how Merian secretly observed the life cycle of summer birds (a medieval name for butterflies) and documented it in her paintings. Focusing on her young life, this book shows readers how curiosity at a young age can lead to a lifelong pursuit. You can view a few of the paintings that were part of the 2008 Getty Center exhibition entitled Maria Sibylla Merian & Daughters: Women of Art and Science. You can view more of Merian’s paintings at the site for the National Museum of Women in the Arts. Often called “the greatest fossil hunter ever known,” Mary Anning made finds that challenged the way scientists viewed the processes by which the natural world changed. 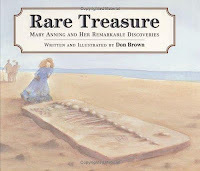 Mary began fossil hunting at a young age, having been taught by her father to look for and to clean fossils. The family sold these treasures to vacationers who came to Lyme in the summer. Even after the death of her father and through the destitute years that followed, Mary continued to hunt for fossils. There have been several terrific picture book biographies written about this remarkable woman. 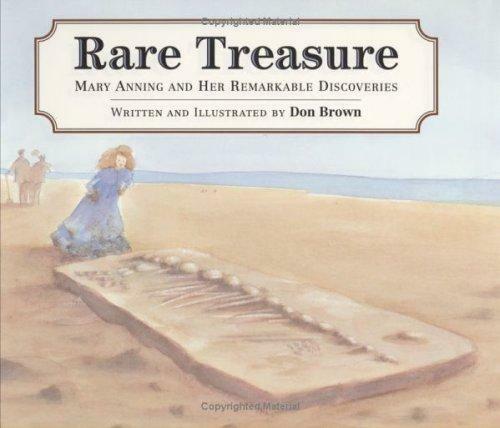 RARE TREASURE: MARY ANNING AND HER REMARKABLE DISCOVERIES, written and illustrated by Don Brown, is an appealing look at Mary’s life from beginning to end. The text and watercolor illustrations combine to provide an insightful picture of a woman whose curiosity led her to spend her lifetime searching for fossils and studying everything she could about them. Mary didn’t just find fossils; she tried to understand them and wanted to know what they told us about our world. MARY ANNING AND THE SEA DRAGON, written by Jeannine Atkins and illustrated by Michael Dooling, focuses on one year during Mary’s life when she worked tirelessly to unearth an ichthyosaur fossil. This same attention to Mary Anning’s childhood fossil hunting is at the heart of STONE GIRL, BONE GIRL: THE STORY OF MARY ANNING, written by Laurence Anholt and illustrated by Sheila Moxley. Finally, for something a bit different, THE FOSSIL GIRL: MARY ANNING'S DINOSAUR DISCOVERY, written and illustrated by Catherine Brighton, tells the story of Anning's discoveries in the form of a graphic novel. You can see images of some of the most well known fossils Marry Anning found at the site of the Natural History Museum. The Lyme Regis Museum web site has information about Mary Anning and displays some of her fossil finds. Known as the first female astronomer in the US, Maria Mitchell was a curious child. She was educated in school, though she was also tutored by her father. His influence on her life and learning was tremendous. Together they calculated the position of their home by observing a solar eclipse. They also acquired astronomical equipment and conducted obervations of the skies. One night she was observing the sky from the roof of the bank where her father worked when she spotted a small object that did not appear on her sky charts. Maria discovered a comet! 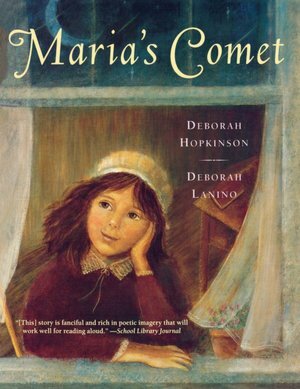 MARIA’S COMET, written by Deborah Hopkinson and illustrated by Deborah Lanino, is a fictional picture book that imagines how Maria's interest in astronomy developed while she was a young girl. Narrated by Maria, readers will meet a girl who helps with her siblings (eight of them! ), mends clothes, and engages in other chores typical for a girl of her era. However, Maria’s heart is clearly with the sky. The text is poetic and Hopkinson manages to include references to all kinds of astronomy known at the time, including planets, constellations, and comets. You can download a reading guide for MARIA’S COMET from the Smithsonian National Museum of American History. The Maria Mitchell Association web site has a wealth of biographical information about Mitchell specifically written for students. Most know Marie Curie as the winner of two Nobel prizes, the first a shared award in physics (1903) for work on radioactivity, and the second in chemistry (1911) for the discovery of the elements radium and polonium. Her constant exposure to radiation and subsequent death are also well known. What is most fascinating, however, is the story of the woman behind these accomplishments. It is the accomplished biography that can make readers appreciate her love of learning and her incredible humanity, while also highlighting the feats that make her so well known. There are several terrific books that do just that. 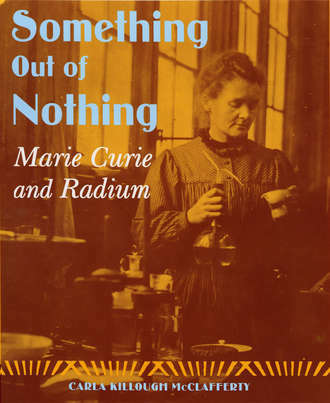 SOMETHING OUT OF NOTHING: MARIE CURIE AND RADIUM, written by Carla Killough McClafferty, is well-researched, highly detailed and well-documented. It’s everything good nonfiction should be. The icing on the cake is the fact that McClafferty spins the facts into a gripping tale. Readers won’t want to put this one down. MARIE CURIE: THE WOMAN WHO CHANGED THE COURSE OF SCIENCE, written by Philip Steele, is also a stunning biography. Steele not only tells Curie’s story in an engaging fashion, but her provides readers with a clear picture of what life in Europe was like from the 1860s to the 1930s. Additionally, there are many photographs and sidebars (informational boxes), as well as a helpful timeline that runs across the bottom of every double page spread. BORROWED NAMES: POEMS ABOUT LAURA INGALLS WILDER, MADAM C.J. WALKER, MARIE CURIE, AND THEIR DAUGHTERS, written by Jeannine Atkins, tells the story of three daughters moving from childhood to adulthood. Each of the three sections of the book begins with a bit of backstory about the mother and daughter and where their story in poems begins. The poems convey a real sense of person, and after reading them you feel you really know these women in an intimate way. The section on the Curie’s focuses on Marie’s relationship with Irène, who often worked by her mother’s side. 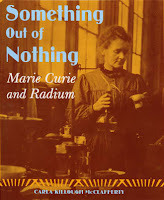 The American Institute of Physics Center for History of Physics has a very nice biography and online exhibit on Marie Curie and the science of radioactivity. The Christian Science Monitor has a very interesting article entitled Marie Curie: Why her papers are still radioactive. It really brings home the dangers of the materials Curie spent her life studying. Women scientists of the 20th century had some pretty big shoulders to stand on. They and we owe a huge debt of gratitude to these amazing women. In reading their biographies, a number of common traits appear. All of these women loved learning and had an incredible thirst for knowledge. They were tenacious and often overcame great obstacles to follow their dreams. They have blazed trails that we would do well to follow. After reading about them, I’m ready to pick up their mantle and carry on. Are you? Visit me at The Miss Rumphius Effect tomorrow for the second half of this post, Women in Science of the 20th Century. I’ll be writing about Rachel Carson, Mary Leakey, Jane Goodall, Sylvia Earle, and Wangari Maathai. 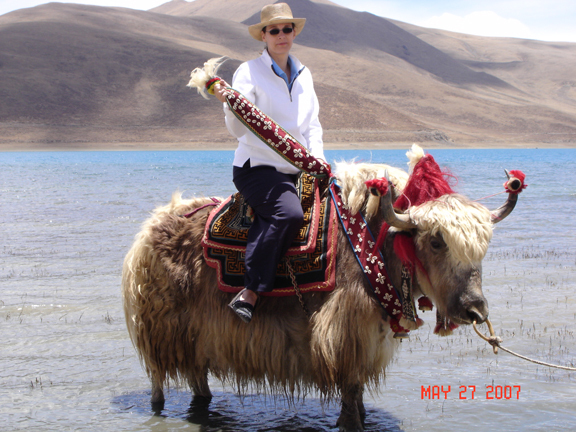 Patricia Stohr-Hunt has, in her lifetime, "worked as a boat hand on a private yacht, assembled physics equipment in a factory, and even tested dog biscuitsfor fat content." She "now hold(s) the two best jobs in the world--one is teacher and the other is mom." In between work and home she manages "to find a few minutes to blog about teaching and books" she loves. I'd love to see more written about Maria Mitchell - and really, Hypatia, since it seems that the Greeks are cool again. Of course, unless we throw in some Olympians and gods, it might not be as cool. ;) Borrowed Names, is, as always, an AMAZING book to add to the list. I'm just reading a biography of Maria Sibylla Merian. It is so wonderful that the the stories of these women are finally being told. I know of a few more who have been overlooked, as well, so progress is still needed. Beryl Markham: Feminist Hero? or Heroic Female? Ancient Queens and Modern "Sluts"
Margaret Knight, aka "Lady Edison"